The No. 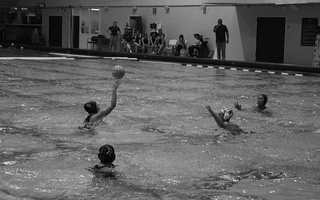 20 Harvard women’s water polo team played three conference games, splitting the weekend 2-1. On Saturday, the Crimson (12-10, 2-2 CWPA) dominated both if its games, defeating Bucknell, 9-5, and George Washington, 15-8. On Sunday, Harvard dropped its second conference game to Michigan, 7-15. Though Harvard trailed Bucknell (13-14, 2-4 CWPA) 2-1 after the first quarter, a second quarter offensive surge helped the team find its footing to win the game. Outscoring Bucknell 4-0 in the second frame, the Crimson entered the second half with a three point lead. In the third quarter, Hong scored a pair of goals to help Harvard secure a five point lead heading into the final period. In the final frame, senior Zoe Osborne found the back of the net to defeat Bucknell 9-5. Along with her two goals, Osborne recorded a career high five assists. Also a strong defensive game, Osborne and freshman Sofia Carrera-Justiz each had two steals, and junior Cleo Harrington had eight stops and two steals in the net. Continuing the momentum from the morning, Harvard dominated against George Washington (13-11, 1-3 CWPA) from the opening minute. The Crimson immediately took control of the game with first quarter goals by Carrera-Justiz, Osborne and senior Eela Nagaraj. Coming of a five-game win streak and its two Saturday victories, the Harvard women's water polo failed to upset No. 7 Michigan on Sunday, losing 15-7 in its fourth conference game of the year. The Crimson put up a strong defensive fight, trailing 2-1 after the first quarter, however, Michigan (25-8, 8-0 CWPA) outscored Harvard 4-1 in the second quarter to take a 6-2 lead at halftime. The Harvard offense came out strong in the beginning of the second half, scoring four goals; however, its efforts were matched by the aggressive Michigan offense. The Crimson failed to make a final stand and Michigan pulled away in the last minutes. Adding to her four goals from Saturday, Carrera-Justiz led the Harvard attack with two goals. Senior Michelle Martinelli, junior Sami Strutner, Hong and freshen Julie Harrison and Mathilde Ribordy each tallied one as well. Harvard returns to action on Wednesday, April 12 against Brown at 7:30 p.m. Despite a strong start to the 2014 season, the Harvard women’s water polo team could not continue its winning ways towards the end of the campaign, finishing 15-20 overall and 2-3 in the Collegiate Water Polo Association Southern Division.